Ah, three-letter airport codes. The bane of most airline new hires! I had to memorize and pass a test on 240 airport codes before my very first day of reservations training at that “other” airline on June 24, 1978. (I aced it.) I thought you guys might enjoy some airport code history, trivia, and Fun! The Origin of the 3-Letter Code Originally, airports just had two letter codes (LA was Los Angeles, NY was New York, DC was Reagan National, etc). Three-letter codes came about in the 1930’s, as air travel started to become a valid option and cities everywhere built airports. 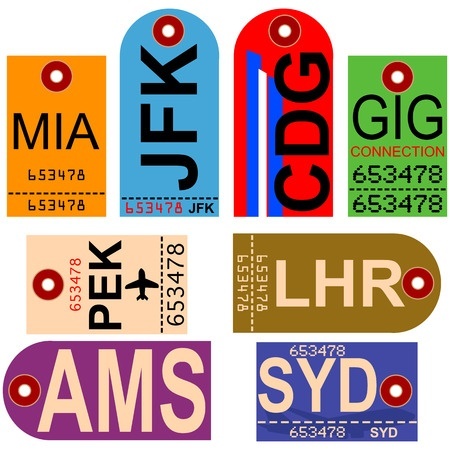 Airport codes are now assigned to airports by IATA, the International Air Transport Association, and no two airports can have the same code. (Note to pilots and dispatchers: these can be different than the four-character ICAO codes—i.e., DAL vs. KDAL, or LHR vs. EGLL). Many airports are pretty easy to figure out—DAL is Dallas, MSP is Minneapolis/St. Paul, DEN is Denver, and so on. But some of them are really inscrutable … some have interesting stories … and for one in particular, I was an eyewitness to its creation! Some Odd Ones Some of the “odd” ones are named after historical figures that are more or less forgotten now. My favorite—and the one that most other people in my class in 1978 got wrong—is SDF. Even though it stands for Louisville, KY, the airport itself is Standiford Field, and is named after long-since deceased Kentucky State Senator, Elisha David Standiford. GEG in Spokane is named after Air Force pilot Major Harold Geiger. New Orleans’s code, MSY, comes from a very old stock yard near the present airfield—Moisant Stock Yards—which was named after a New Orleanian barnstormer, John Moisant. MSY was recently re-named in honor of hometown jazz legend Louis Armstrong. Kansas City’s old airport was MKC—Missouri Kansas City—but the current airport is MCI, for Mid Continent International. Orlando took its code from the former air force base that occupied the property, McCoy AFB—and the Florida ANG maintains a presence on the Western fringe of the facility, very near AirTran’s former headquarters. John Wayne International Airport in Orange County is named after the city in which it sits, Santa Ana. Back up in New England, BDL in Hartford is named for Air Force Lt. Eugene Bradley. Portland, Maine’s airport code is taken from an old name for the field, Portland-Westbrook Municipal Airport. Some Funny Ones Then there are the funny ones. Wenatchee, Washington’s airport code is EAT. The area is in one of the most productive apple-growing areas in the world, and rumor has it that the airport code was a wink and a nod to encourage people to EAT more apples. Sioux City, Iowa, had the unfortunate luck to be assigned SUX as its code—and after years of trying to have the code changed (after all, who wants an airport that SUX? ), they now embrace the code and use it as their slogan—“Fly SUX”! And Canada ... mon Dieu, Canada ... all Canadian airports were originally required to start with the letter Y, and they've recently added the letter Z as an option. But this means you’ve really got to think about those! YVR is easy enough—Y, because it’s Canada, and VR, for Vancouver. But others are apparently random. YYZ stands for Toronto’s Pearson Int’l airport, even though there’s not an extra Y or a Z in the city or the airport name. Montreal’s airport, Dorval, is similarly inscrutable, as neither the city name nor the airport name has a “U” in it. Some I’ll Never Forget My favorite airport code story is the one I got to sit in on. Before we announced service to the beautiful new Panama City Airport in Northwest Florida, there was quite the kerfluffle between the airport, the U.S. Department of Transportation (DOT), and the International Air Transport Association (IATA). The airport and DOT had agreed to use the code TFB, for The Florida Beaches. The problem with that is that TFB was already assigned by IATA to some remote airport somewhere else in the world. So one afternoon, a group from Southwest's Marketing and Network Planning Departments got the IATA, DOT, and Panama City airport people on a conference call to hash the issue out. After a bit of bluster, they started going through available three-letter codes, and one of the first to be mentioned was ECP. We all realized it had no meaning at all—until one of my favorite Network Planning colleagues very quietly said—“Everyone Can Party.” And after we muted the conference call and laughed like crazy for a bit—the code stuck!